The Kingston Centre for Independent Living wanted capture the experiences of key partners in their ‘Fighting for our Rights’ project. I shaped and delivered a stakeholder evaluation, providing insights into the involvement of the six partners. The report was sent to the Heritage Lottery Fund, as part of KCIL’s final report, and to Kingston University, to shape and offer evidence for future collaborations. 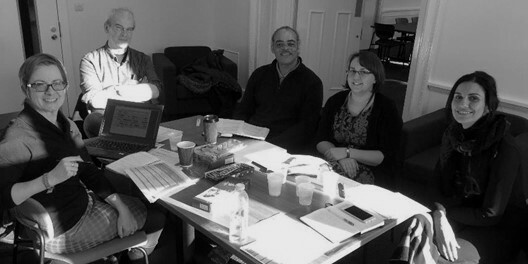 Left to right – project stakeholders: Theresa Nash, Chris Hutchison, Eli Anderson, Gillian Butler and Paty Paliokosta. Photo provided by Jen Kavanagh. Student teachers from Kingston University creating a new school resource. The stakeholder evaluation was commissioned by Jen Kavanagh, Oral History Project Manager at KCIL. Individual interviews were conducted with the six key stakeholders, with conversations steered by a Discussion Guide. The data was transcribed, collated and analysed, drawing out key themes and remarks to illustrate the range of responses across the partners.